Le Doulos (The Finger Man) (1962) [Nutthecchio]: Shot to death by Jean-Paul Belmondo, who then makes it look as though Michel and Jacques de Leon killed each other. The Sleeping Car Murder (Compartiment tueurs) (1965) [Rene Cabourg]: Killed (off-screen) by Claude Mann on the train. Topaz (1969) [Jacques Granville]: Commits suicide by shooting himself. 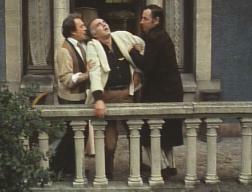 La Grande bouffe (Blow-Out) (1973) [Michel]: Commits suicide by overeating during an extended feast, causing him to die of excessive flatulence/diarrhea after walking out onto the balcony.